1. July, August: Reservations will be accepted from Saturday to Saturday only. 2. Reservations must be made at least two weeks prior to arrival date (date of check-in). Otherwise the property will not be available and you will have to cancel your booking as indicated in our internal rules below. For any exceptions, please make a contact request before booking to check availability and discuss with us. In the heart of the Drôme Provençale, between Dieulefit, Nyons and Grignan. In the heart of the old chapel of a fortified farm surrounded by vineyards and lavender fields. Ideal rental for lovers looking for romantic moment or small families. 2 terraces exposed East and South-West: to enjoy the sun shining all day long. We have restored this old chapel to welcome our guests in this area we love so much and have them discover it. We hope you'll enjoy your stay and respect our work. 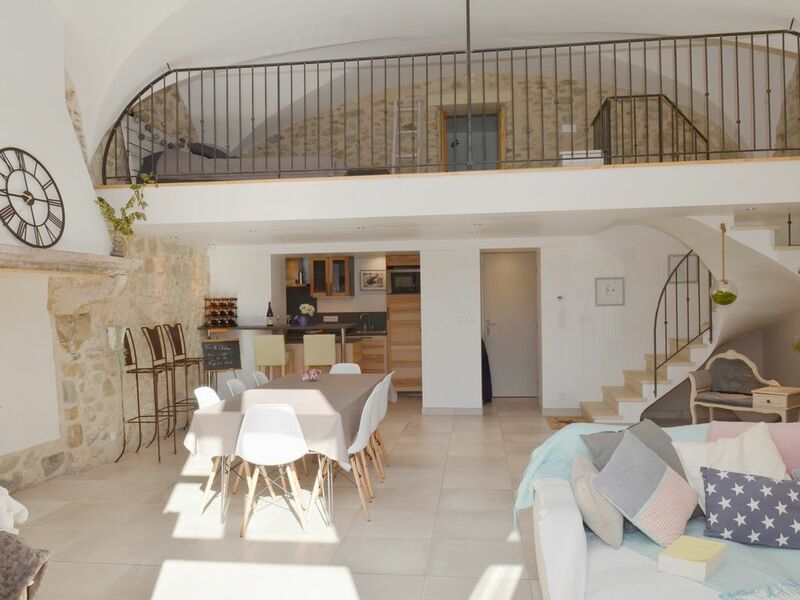 The loft is situated in the former chapel of a XIVth century castle. You will appreciate the unusual and historic context. In summer, you will enjoy the "natural AC": walls are up to 6ft thick! We had a fantastic week at this lovely, well equipped and stylishly furnished home. We are a family with two young children and they enjoyed their bedroom immensely and we enjoyed all the well thought through features of the home. The location is great, we really recommend canoeing on the Drome from Sallians and visiting nearby Nyons. There is a nice family aquatic centre in Nyons. The area is surrounded by vineyards and lavender fields so it really is a pleasant environment to be in. Nous avons passé un excellent séjour dans ce gîte atypique et très séduisant. Parfaitement aménagé, il est confortable, bien équipé et décoré avec beaucoup de goût. Son emplacement est idéal pour découvrir la région de Dieulefit et Nyons qui offrre quantité de découvertes et magnifiques promenades. Très bel endroit pour passer un séjour en amoureux et découvrir la Drôme provençale. Le gîte fraîchement rénové et très bien pensé, a toutes les commodités pour se sentir comme chez soi. Très bon accueil, le lieu est superbe, le château très bien restauré ! Séjour parfait : hôtes accueillants, environnement paisible, gîte parfaitement propre et fonctionnel.